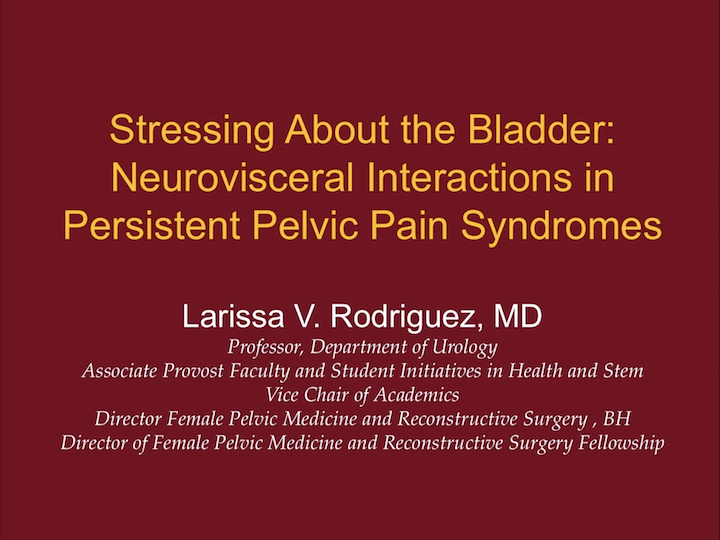 Larissa V. Rodriguez, MD, presented “Stressing About the Bladder: Neurovisceral Interactions in Persistent Pelvic Pain Syndromes” at the Jackson Hole Seminars on February 7, 2018 in Jackson Hole, Wyoming. 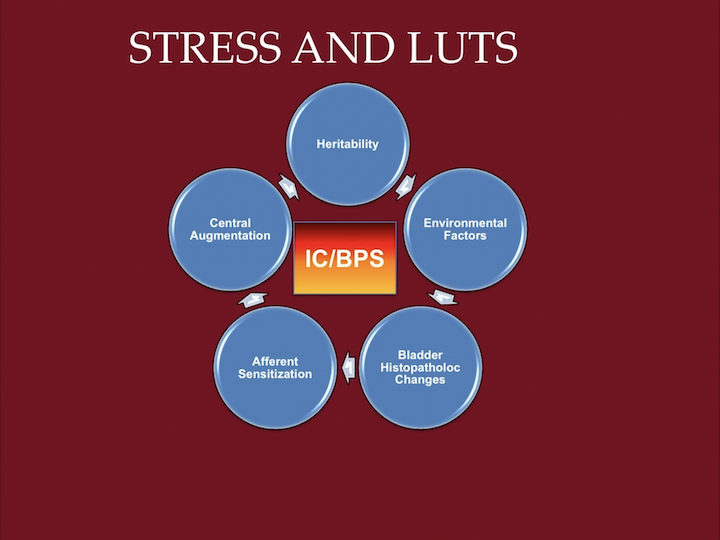 Larissa V. Rodriguez, MD, discusses the role of environmental stress in lower urinary tract symptoms (LUTS) and interstitial cystitis (IC) and the development of the Multidisciplinary Approach to the Study of Chronic Pelvic Pain (MAPP) Research Network. 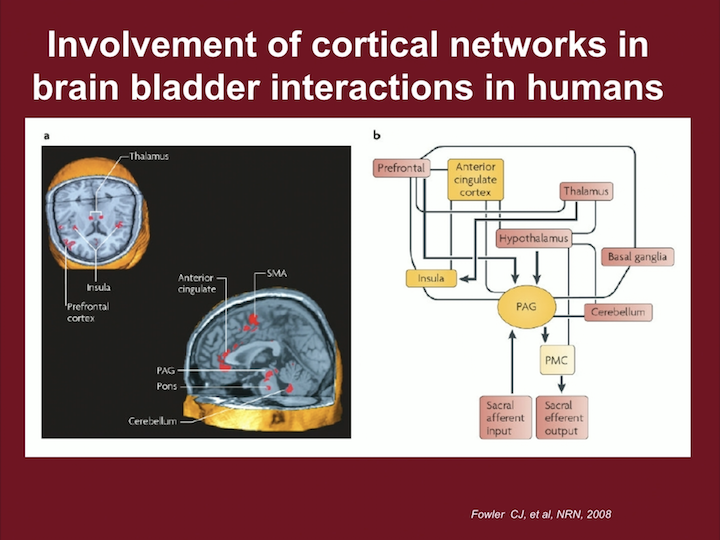 She explains how the neurovisceral interactions involved in processing, emotion, and attention affect bladder function, and how studying this link help develop future treatment options. 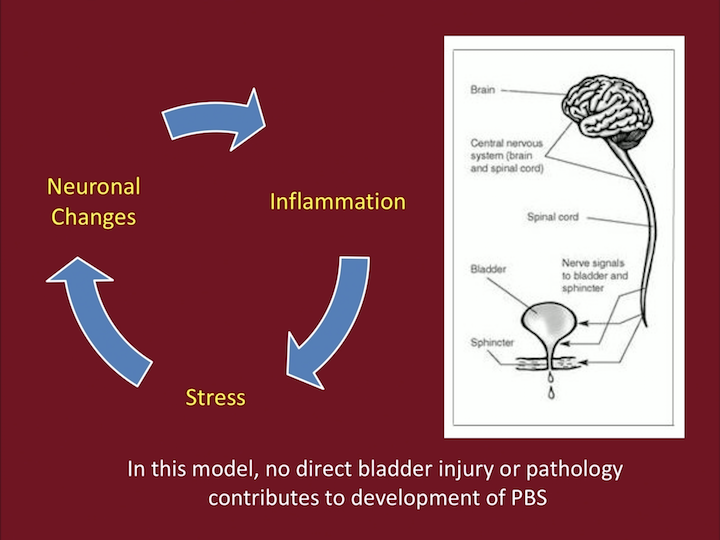 Today, I’m going to talk about stress and how it relates to the bladder, and the neurovisceral interactions, how the brain and other parts of the body are involved in pelvic pain syndromes. 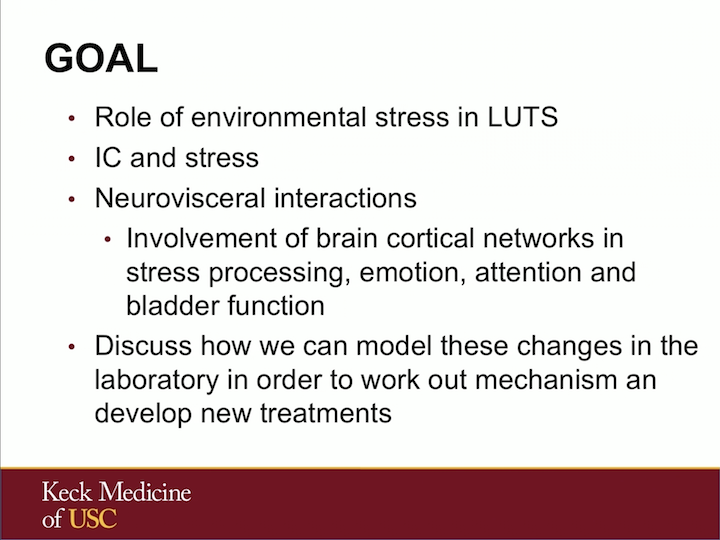 The goal of this talk is to discuss the role of environmental stress in lower urinary tract symptoms, as well as in IC bladder pain syndrome, talk about how the brain and the cortical networks in stress processing, emotion, attention and bladder function are related to each other, and discuss how we can model this in an animal model that we do in our laboratory. And we’re studying this to see if we can find new mechanisms that will help us develop new treatment options for these patients. 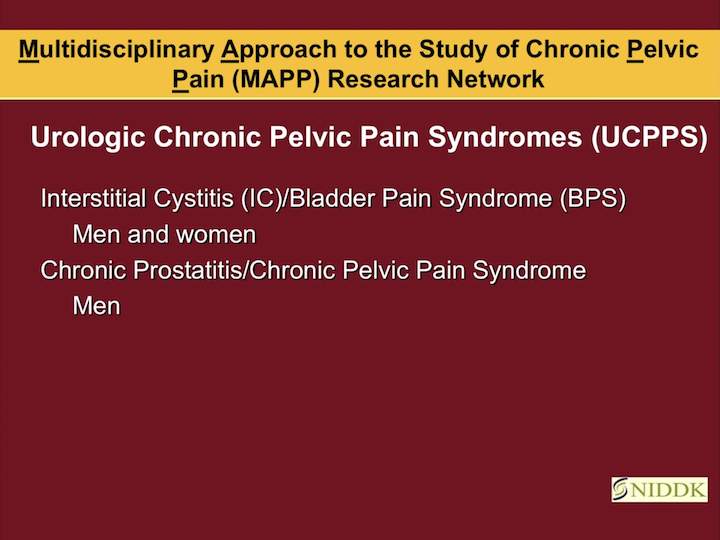 I want to discuss one of the PIs has joined a program with UCLA and USC, one of the PIs of the Multidisciplinary Approach to the Study of Chronic Pelvic Pain, where we’re studying patients with interstitial cystitis/bladder pain syndrome, both men and women, as well as men with chronic prostatitis. 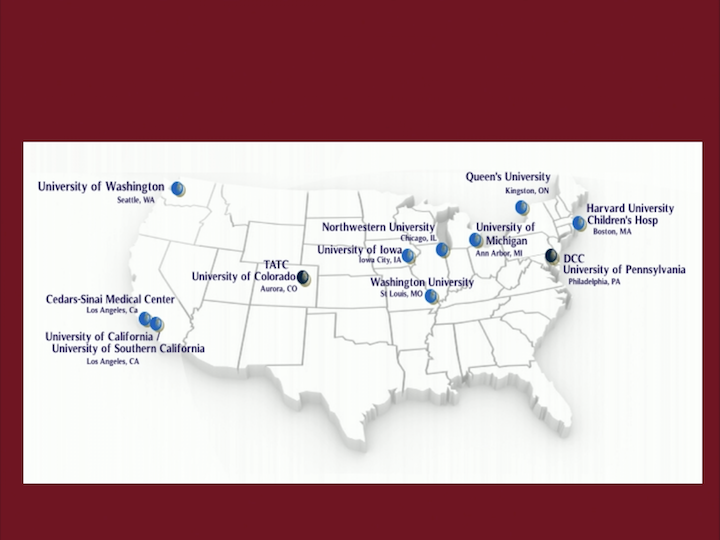 It’s a number of sites across the country, and we have pulled all these patients together. Some of the data that I’m going to present to you today have come from already eight years of being in the MAAP network. So, if we look at the individual, and we look how the pelvis, the bladder functions, the spinal cord, the brain are related to each other. 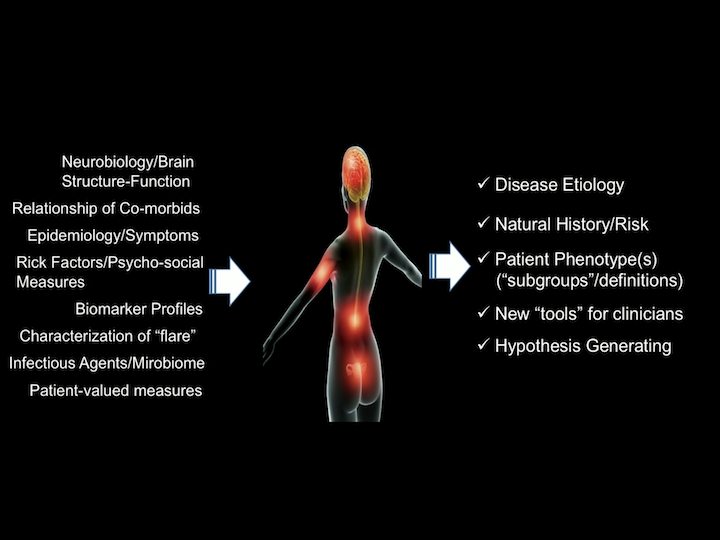 Part of the aims of the MAAP was to really phenotype patients by looking at the neurobiology of the brain and structure of the brain and function, looking at all the co-morbidities, looking at epidemiology and symptoms, risk factors, psychological factors, biomarkers in urine, in saliva, genotyping of some of these patients, looking at the microbiome, and see how all these things interact to really give us a better understanding of who these patients are, how these diseases developed, if they are subgroups of patients that are different from each other that might respond to therapy very differently from each other. And, to give clinical tools to really better understand these patients and what are the treatment alternatives for them. So, more epidemiologically, talking about what is published and what is available. 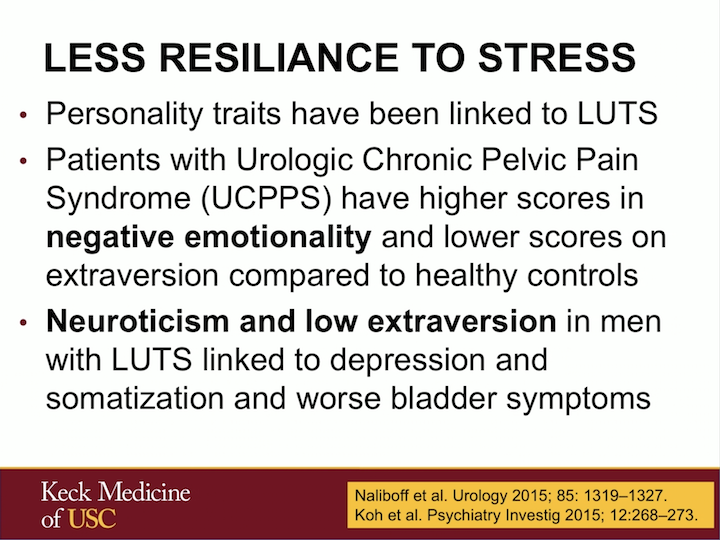 Between stress and lower urinary tract symptoms, in general, we know that patients with lower urinary tract symptoms, when you look at them and compare them to control, report being more likely having childhood traumatic experiences, having acute and chronic stress in their lives that are higher than in the general population, and they’re more likely to have other psychiatric co-morbidities. 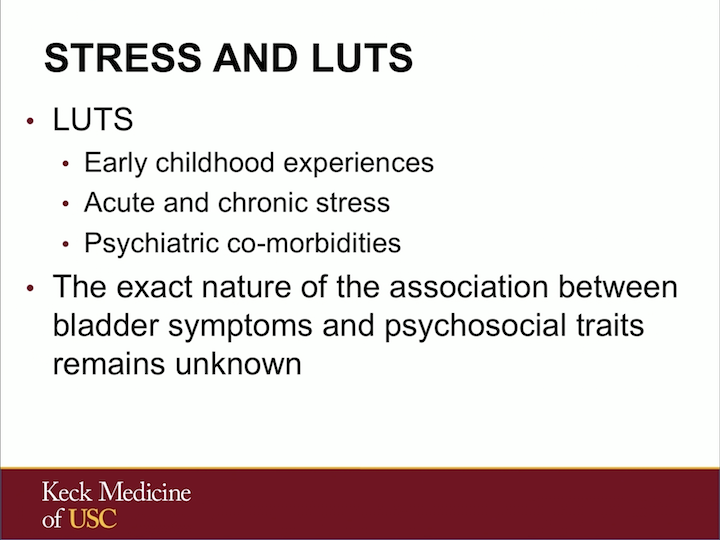 The exact association between these bladder symptoms and psychological traits are unknown, but I’m going to try to go through this talk and try to show to you what we call the micturition center, and how it is modulated. It’s so related to emotion and attention, and how some of these things might be related to each other. 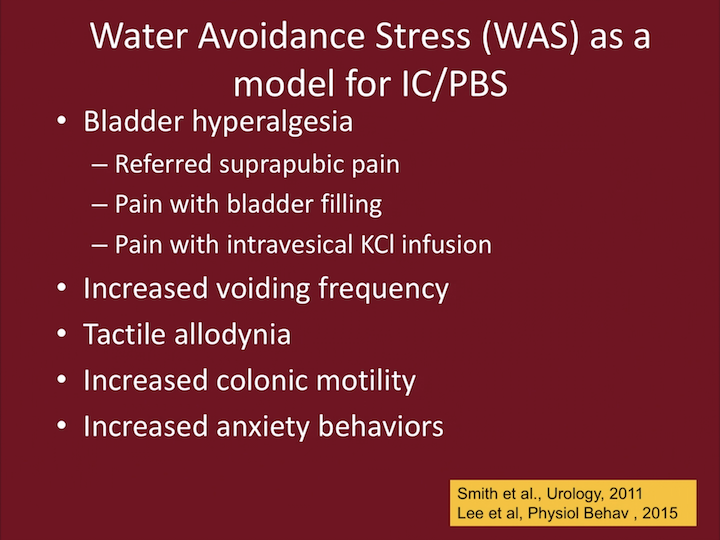 Looking at overactive bladder and IC, these patients have higher psychological stress level comparing to health control as well. Some of this data has come from the MAAP study, some of it has come from individual centers. Patients with overactive bladder have positive correlations between high stress level, anxiety, depression, and more severe incontinence. And there’s been a couple of studies done in military personnel, both women and men, but women with PTSD, depression, and anxiety are almost three times more likely to report overactive bladder symptoms and urinary frequency. 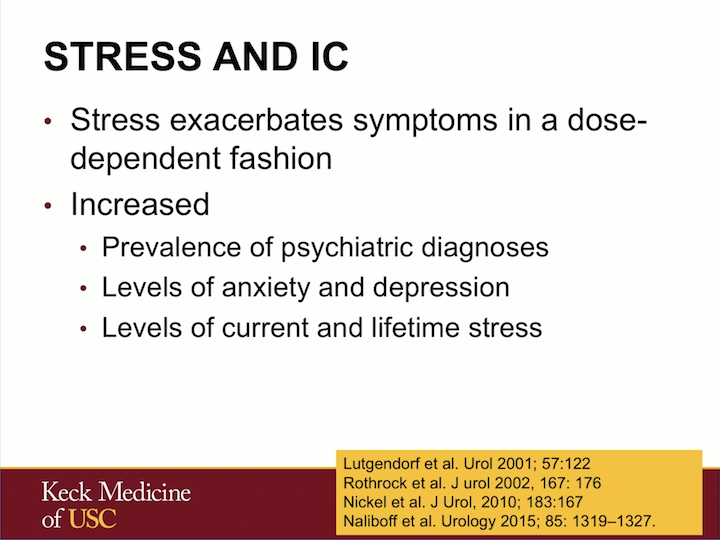 The association between stress and IC, I think, is well known to us and to clinicians. We know that stress exacerbates symptoms, how the patients get flares, what they call flares when they have high stressors in their lives. We know that this is actually a dose-dependent correlation. There is a high prevalence of psychiatric diagnosis in this patient population, levels of anxiety and depression, and levels of reported current and lifetime stress in these patients. 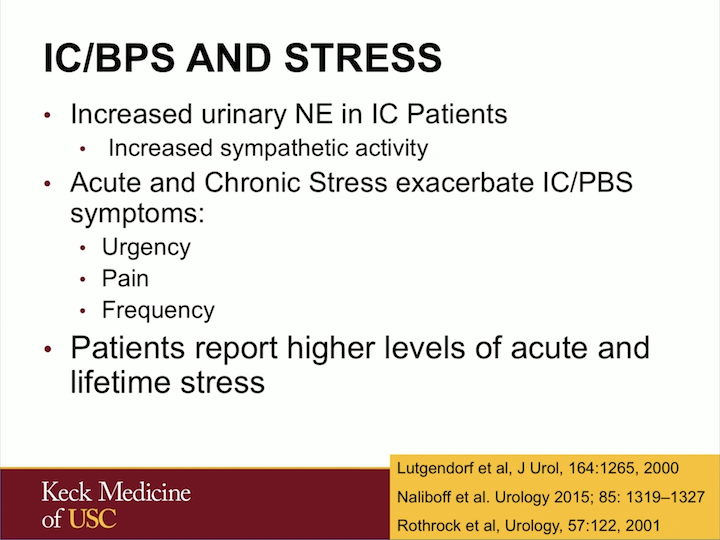 There have been a few reports that have shown norepinephrine to be higher in patients with IC, and the urinary norepinephrine kind of suggesting an increased sympathetic activity and tone in these patients. And chronic stress can exacerbate symptoms of both urgency and pain, as well as frequency. Patients report higher levels of lifetime stress. And there’s some kind of interest now to this resilience to stress. Not only is there more stress, but how patients or individuals deal with stressors. There have been a number of personality traits that have been studied in the IC population. In the MAAP study, patients with UCPPS have higher scores of negative emotionality and lower on extraversion compared to healthy controls. And neuroticism and low extraversion, at least in men with lower urinary tract symptoms, have been linked to both depression but also to worse bladder symptoms. Some of this may be genetic. There have been some recent studies that have showed some polymorphisms in particular genes in the beta-3 adrenoceptor, which is clearly linked to sympathetic tone, that have been linked to development of overactive bladder. 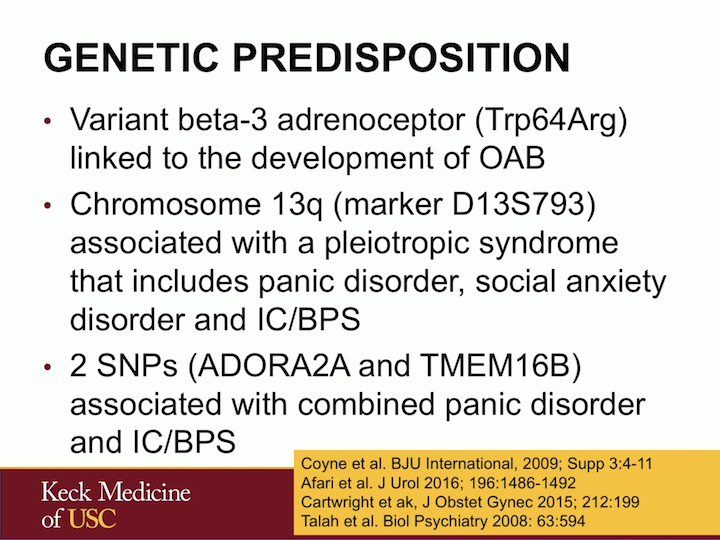 There is a syndromic defect in chromosome 13q that leads to this pleiotropic syndrome that includes panic disorder, social anxiety, and IC. There have been describing in families of patients where many individuals are affected. And there are least two SNPs that have been identified that are associated with panic disorder and IC/bladder painful syndrome. So, there is some genetic thought that there might be something in particular with these individuals. So what see, is that we can think of IC bladder painful syndrome in a slightly different way, not just a disease of the bladder, but that there are some individuals that might be vulnerable by genetics and heredity, that there might be some environmental factors that predispose them, as we saw with the military personnel and PTSD, that this can lead to bladder histopathologic changes and afferent sensitization that leads to central augmentation in the brain that has this loop that continues kind of feeding on each other. 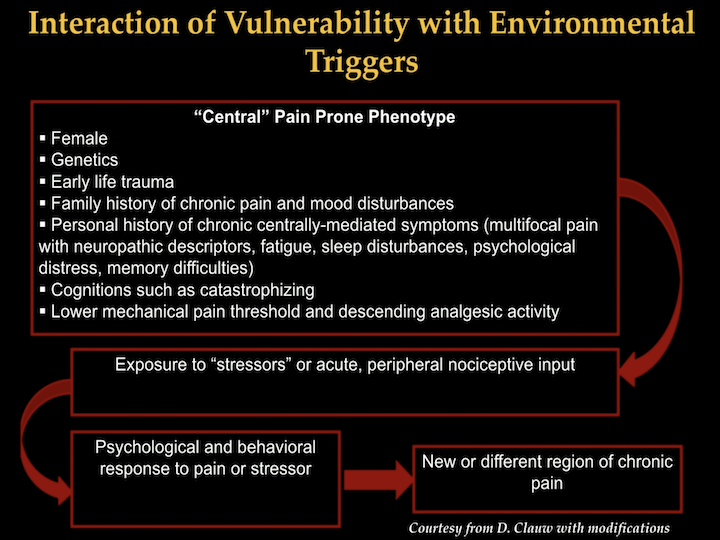 In this way, stressors in a particular vulnerable individual that has suffered particular environmental factors or is exposed to environmental factors can have this up regulation of the pain response. So, looking at it as a different paradigm, we think that there might be, as I just said, individuals that might be pain prone and that this might include gender, genetics, early life trauma, family history of chronic pain and mood disturbances, personal history of centrally-mediated symptoms such as fatigue, depression, memory difficulties, particular cognitions that are personality traits are really not very changeable, like catastrophizing, and that this might all lead to lower mechanical pain thresholds, that then when these individuals are exposed being a bad tract infection, recurring urinary tract infection, a local insult to a particular organ, they can have this over-response and this psychological behavioral response to the pain and the stressor that leads to this chronic kind of maintenance of symptoms. 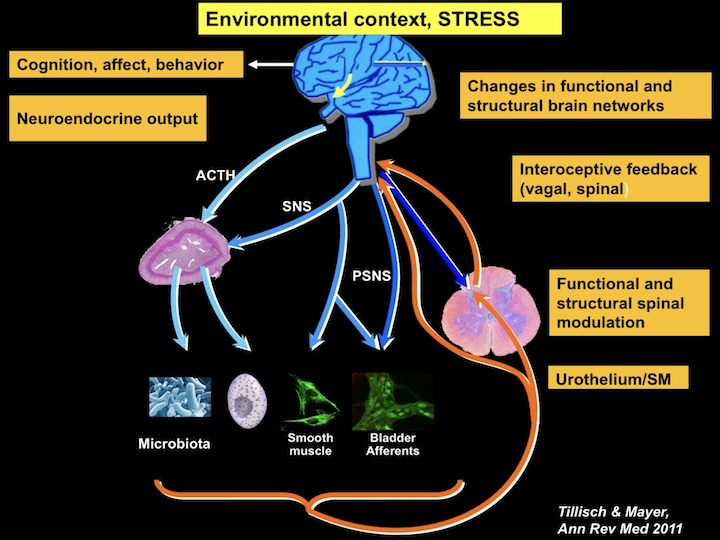 So, in this paradigm, the brain is very associated with the bladder, with the afferents, the smooth muscle, the immune cells, and now we have knowing more and more about how the microbiota might be related, both to the brain as well as to function. But, where this changes in function and structure in the brain are mediated through the spinal cord, can directly affect the periphery. And where peripheral symptoms, peripheral insults, infections, trauma, can also up regulate this whole system, kind of creating this cycle of maintenance of neuronal changes, inflammation, and stress kind of being in that loop. 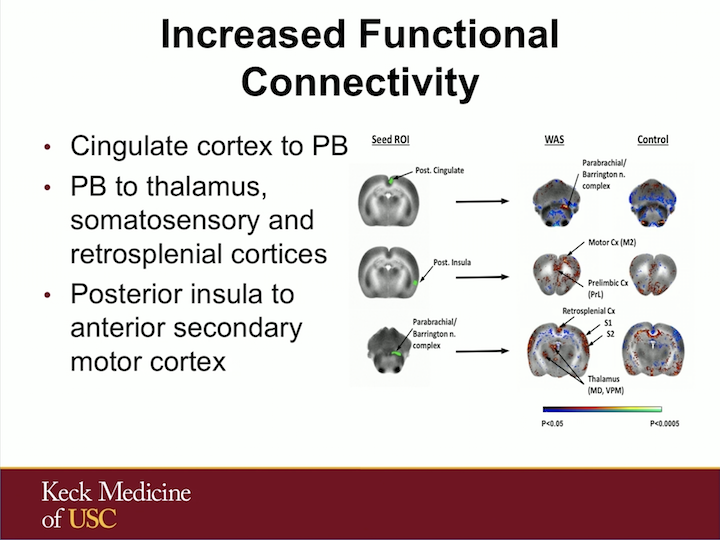 Now, when we look at what we call the Pontine Micturition Center, which here is PMC, we can see the Pontine Micturition Center leads to sacral efferent output, and it’s what we think about the voiding reflex, but it’s highly associated and controlled with up and down mechanisms to the thalamus, to the insula, to the periaqueductal gray, what is in the chart as PAG, and centers that really deal with emotion as well as stress and other mechanisms. 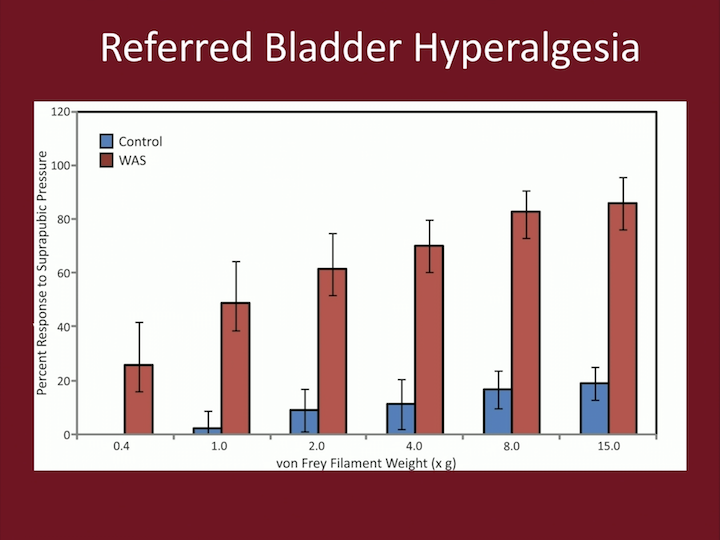 And that sacral efferent input can also impact these centers. So, and this is a slide borrowed from a concept by Rita Valentino at Penn, and some of the things this Barrington nucleus which is part of the micturition center is involved in this kind of whole network in the brain of attention and emotion, where acute effects can lead to attention and emotional arousals, and there’s some reason why we need to be able to shift our attention to be able to urinate, just normally. 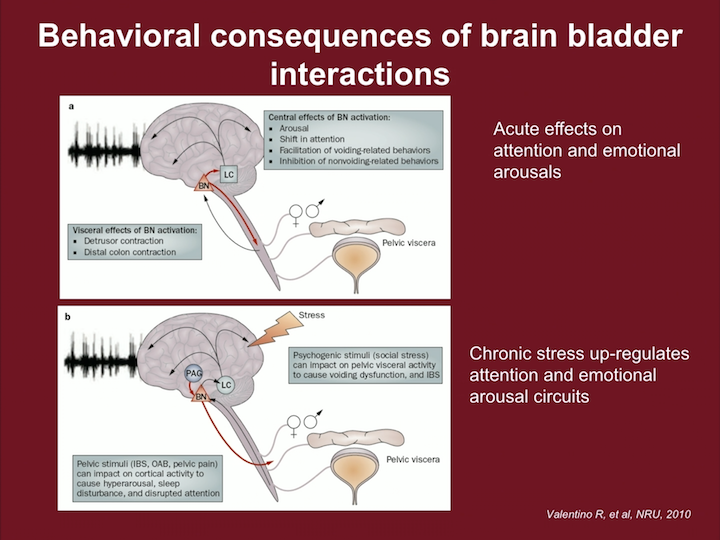 And when this is altered, if somebody is exposed to chronic stress, this whole mechanism of attention and emotionality can be involved with our micturition responses. 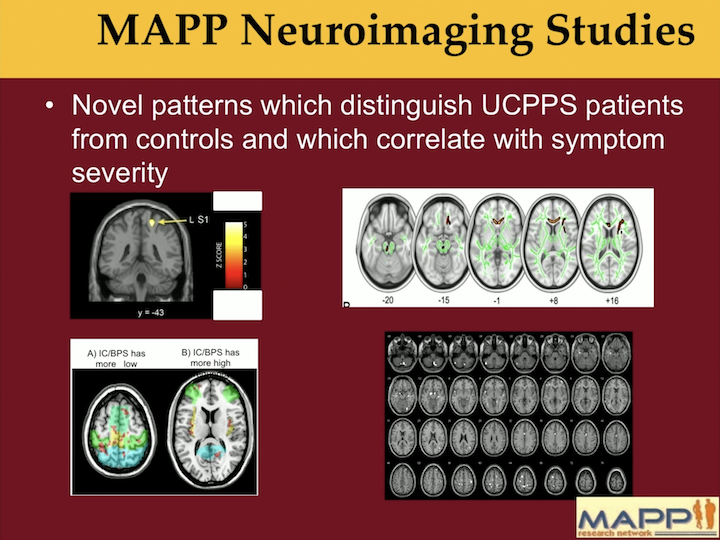 What we see in the MAAP network is that there are clear patterns of brain activation in UCPPS patients that differentiate them from controls, and this has been across the network and has been a really exciting finding. 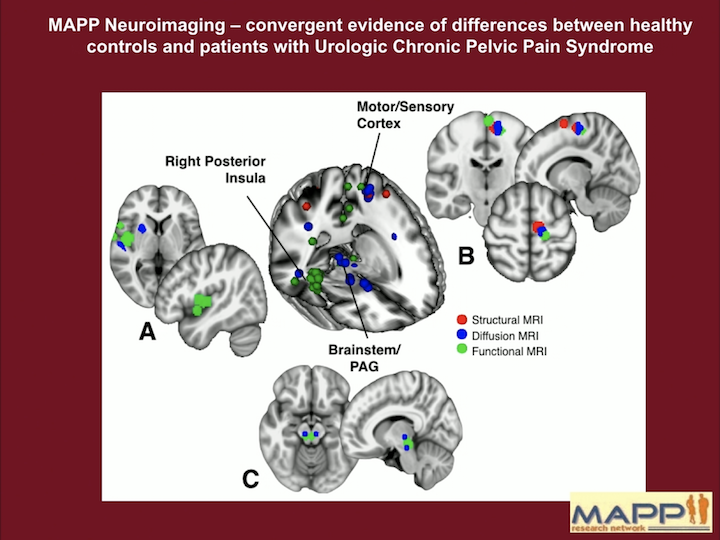 But, beyond these differences in patterns, we know that there are sensorimotor regions, that are here in this image shown in red, that should alter connectivity with the regions that are in yellow, and that this is greatest in patients endorsing pain during bladder filling, so that actually fullness in the bladder can alter these connections in the brain. 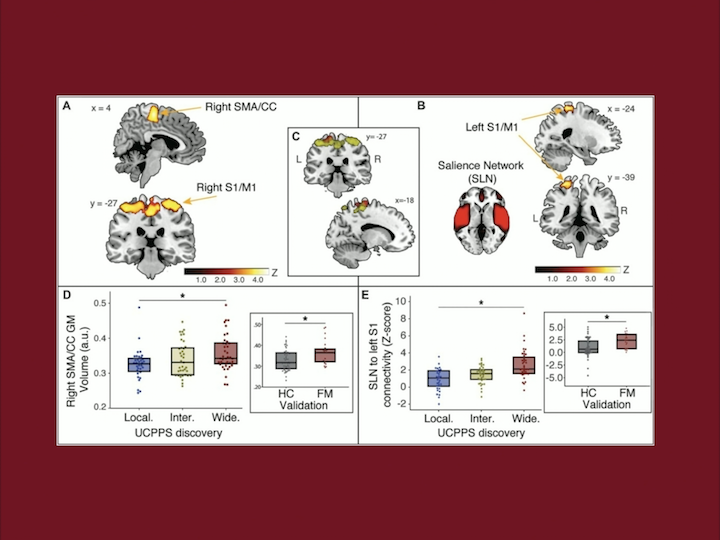 This is a summary of pretty much all the brain findings, both structural MRI, diffuse MRI, as well as functional MRI, so looking at connections in the brain, not just areas of the brain that are different. And there’s a number of findings in these centers that I discussed before. I’m going to break them down for you a little bit. In a recent article that was published in the journal Pain, we were able to separate these patients with IC and UCPPS and patients that had pelvic pain alone, more diffuse pain, or really diffuse pain all over the body. 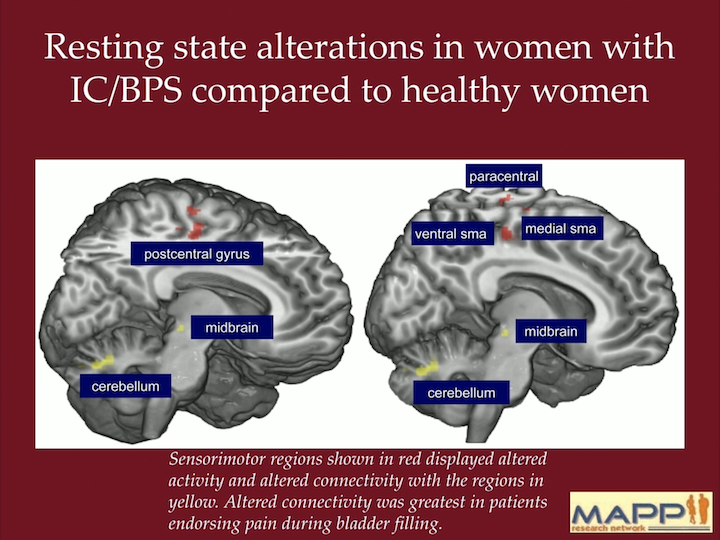 And interestingly, the brain signature we can predict pretty much by the brain findings, which patients have only pelvic pain, have pelvic pain and beyond, which we call a really diffuse pain. So that we can see that phenotyping the central response is really crucial, and it’s really giving up a lot of information on how different these patients are from each other. So we have tried to model this in the laboratory. 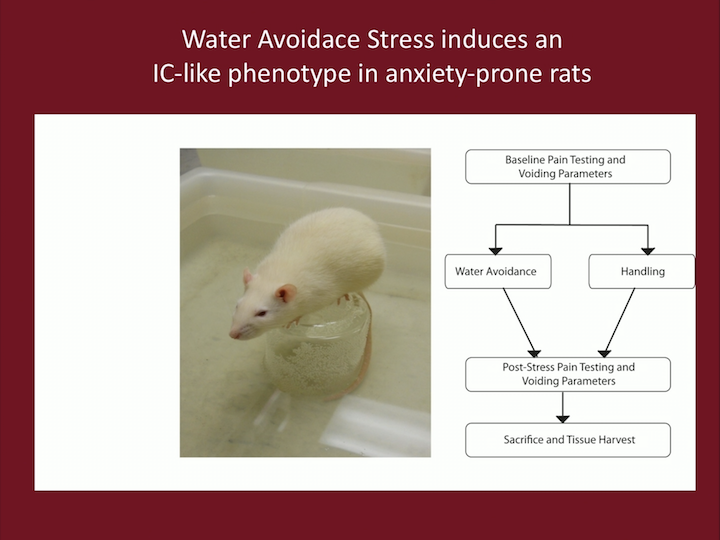 We actually take these rats that are genetically predisposed to stress and anxiety, try to model what these individuals are experiencing, and we stress them out. We put them in a little container in a big container surrounded by water. Now, rats can swim, this is not cruel, we just put them there, but that stresses them out enough, you put them there for an hour a day. And then we just handle, some of them we put in this what we call water avoidance stress, they try not to jump in the water, and then we do a bunch of testing on them. And we have published that these animals have bladder hyperalgesia, they have referred pain in the suprapubic region, they have pain with bladder filling, they have increased voiding frequency, they have tactile allodynia which has also been shown in humans, they have increased colonic motility, and they are anxious. 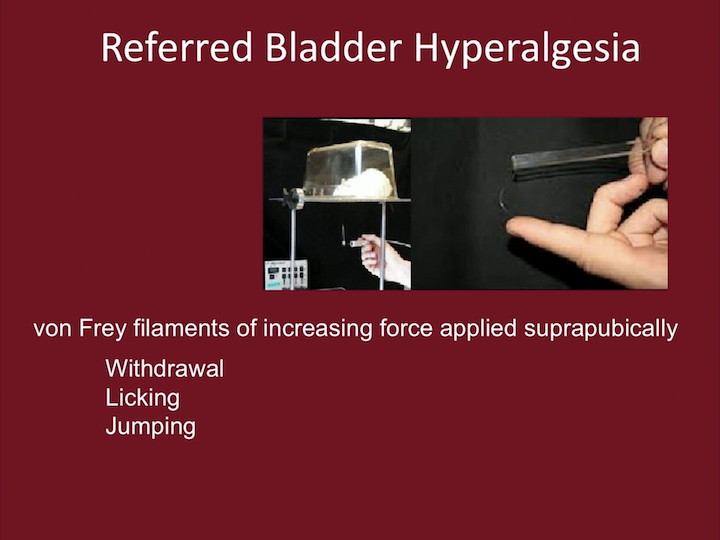 So, we test the referred bladder hyperalgesia by using this little kind of wires that are very fine that we put in the suprapubic area, and we see when the animals react by withdrawal, licking, or jumping. And as you can see in this chart, the WAS is the red columns, and the animal, the controls, are the blue columns, and what you see in the x axis is really strength of these wires in the suprapubic region. So you can see that there is a very dramatic difference in how these animals experience discomfort in the suprapubic region. This here, reflects in the upper lines, the control, and the lower one is the water avoidance stress animals. And this is a response to bladder distension. So, not just pain in the pelvis, but really bladder distention, so we can distend them at different pressures: zero, ten, twenty, thirty, and forty. At forty, it’s kind of maxed out, all animals get pain. And we can measure a surrogate of pain, because we have transducers in the abdomen and we see how the animal contracts, so this is what this is measuring. 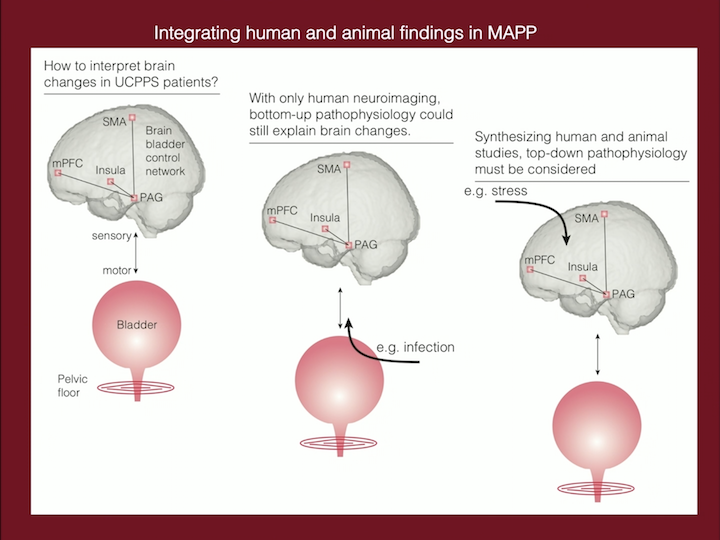 Recently, at the end of last year, 2017, we published one of the first studies looking at brain responses in animals that have been exposed to stress, really kind of trying to replicate what we are doing in the MAAP. 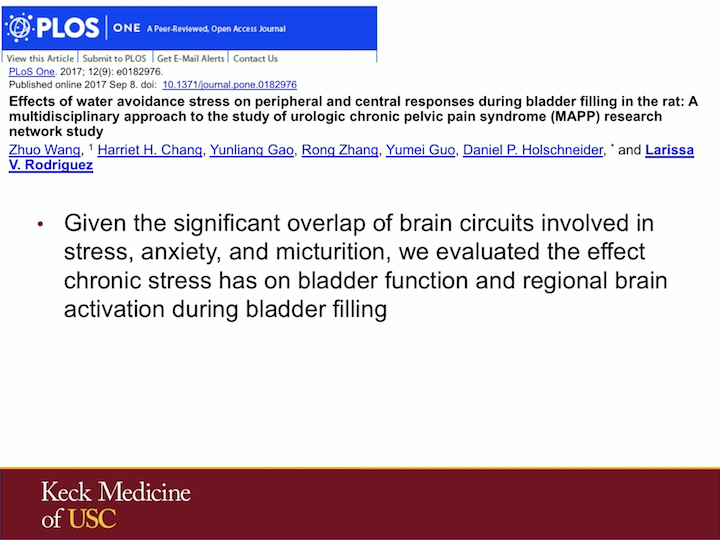 So given the significant overlap of the brain circuits involved in stress, anxiety, and micturition, we evaluated the effect of chronic stress has on bladder function and regional brain activation during bladder filling. And what we found, so these animals all had distension of the bladder, and we distended it at twenty centimeters of water, where our control will have no response at all, and a WAS animal exposed to stress will have a response. 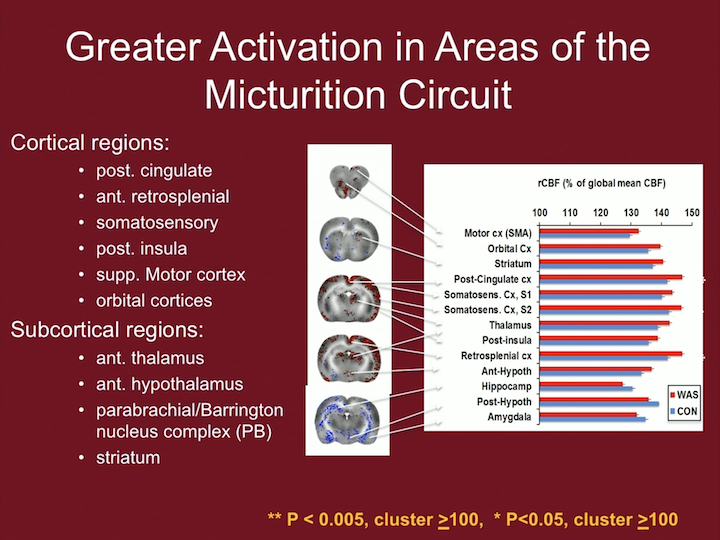 And we saw a number of cortical regions that had greater activation, as well as subcortical regions that really parallels some of the regions that we’re seeing in the MAAP in the humans. We also saw increased connectivity to the Barrington nucleus that is part of that pontine micturition center in these animals exposed to stress. 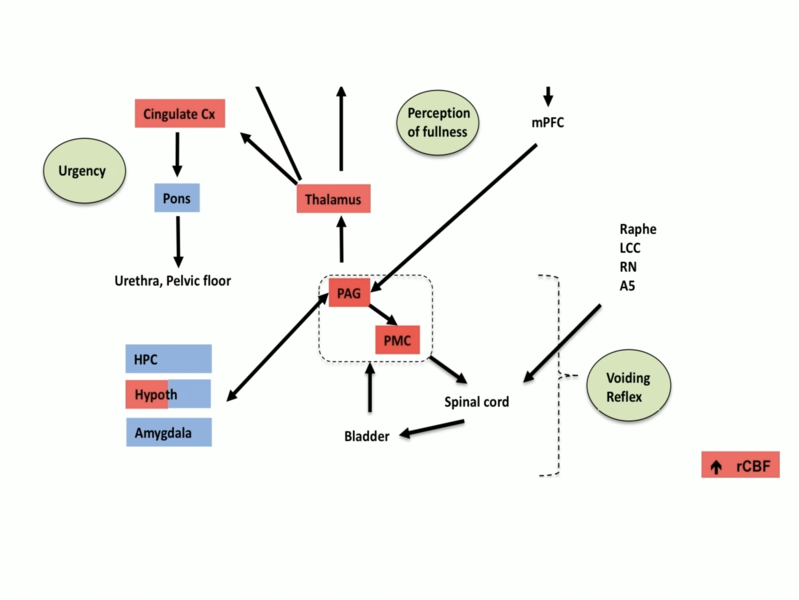 And in this, this is kind of a schematic of what this network is, the Pontine Micturition Center and the periaqueductal gray in the middle, is involved in spinal cord and activation of the bladder, leading to bladder contraction. And many of these areas that we are seeing in this animal model, as well as in the humans, are involved with perception of fullness, as well as urgency. 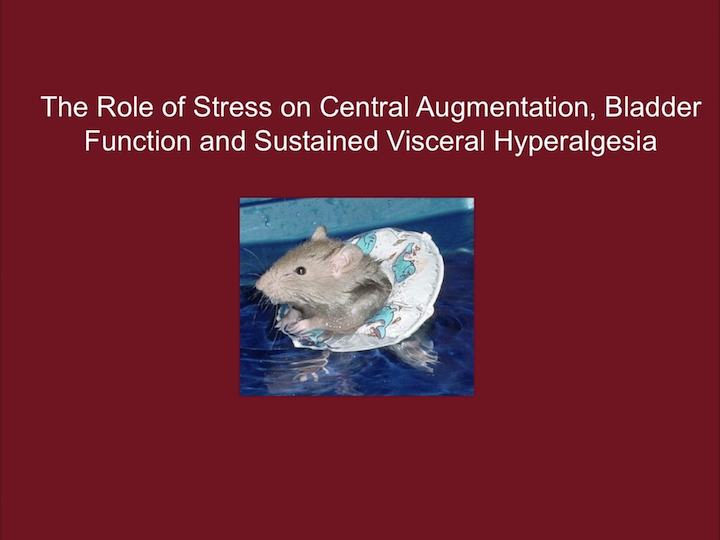 So, in conclusion, from the animal protocol, the water avoidance stress animals have visceral hypersensitivity during bladder filling with increased engagement of portions of the micturition circuit related to bladder fullness and urgency, bladder sensations and its relay to motor regions coordinating bladder contraction. 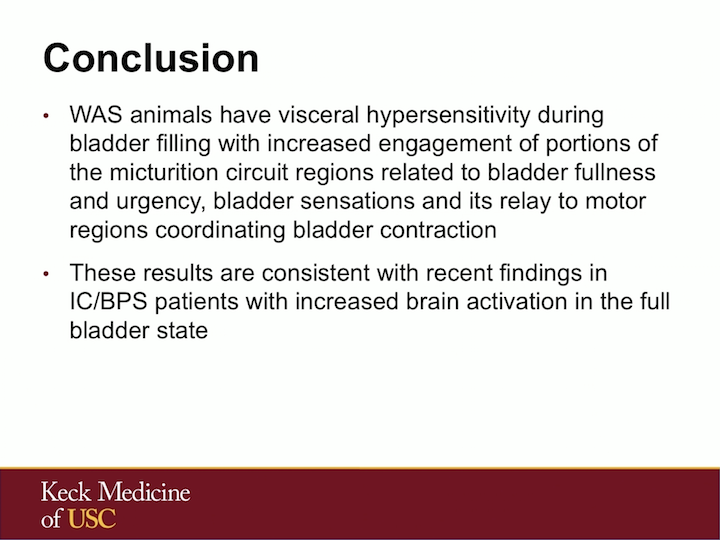 These results are consistent with the recent findings in IC/BPS patients with increased brain activation in the full bladder state. 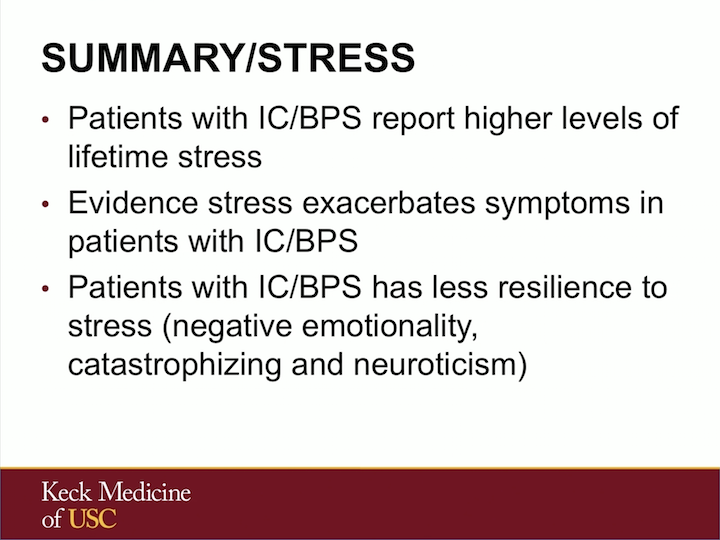 The summary of this talk: Patients with IC/BPS clearly report higher levels of lifetime stress. 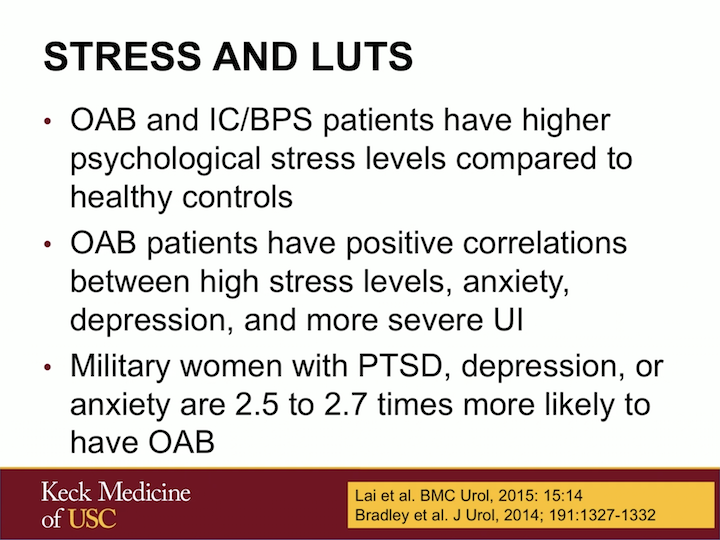 There’s evidence that stress exacerbates their symptoms in these patients that is dose response related. These patients have less resilience with negative emotionality, catastrophizing and neuroticism that makes them less likely to be able to respond in a positive fashion, or at least cope with stressors. Our animal model has a high construct validity to the human IC condition. 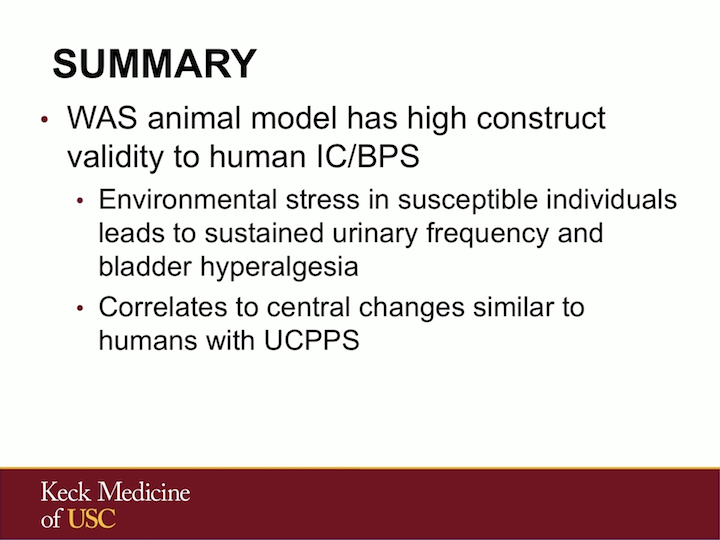 This environmental stress in susceptible individuals can lead to sustained urinary frequency and hyperalgesia of the bladder, which are similar to the findings we see in UCPPS. 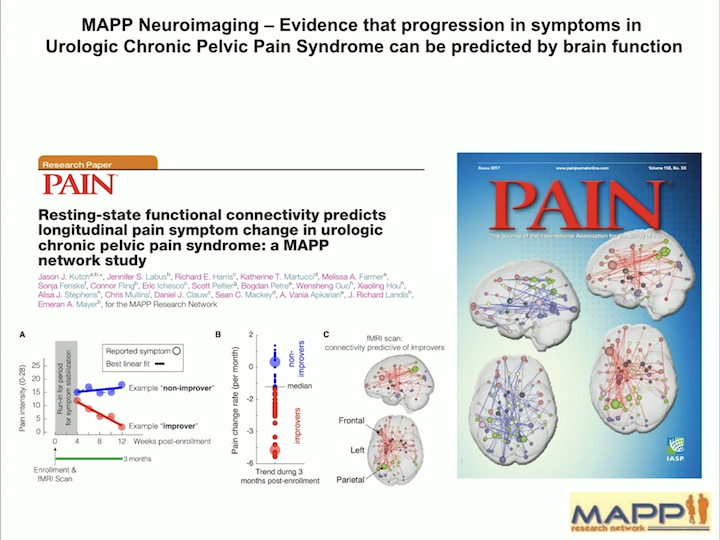 So, in summary, on the left, what we know from the MAAP and the human studies is that there are these changes in these regions in the brain that can lead to this kind of phenotype of the bladder with frequency, urgency, pain. In the middle, we don’t know what happens first. When we look at patients that have already been diagnosed, we don’t know if the brain abnormality happened first and led to the bladder abnormality, or if a bladder insult that is continuous can lead to this activation in the brain. 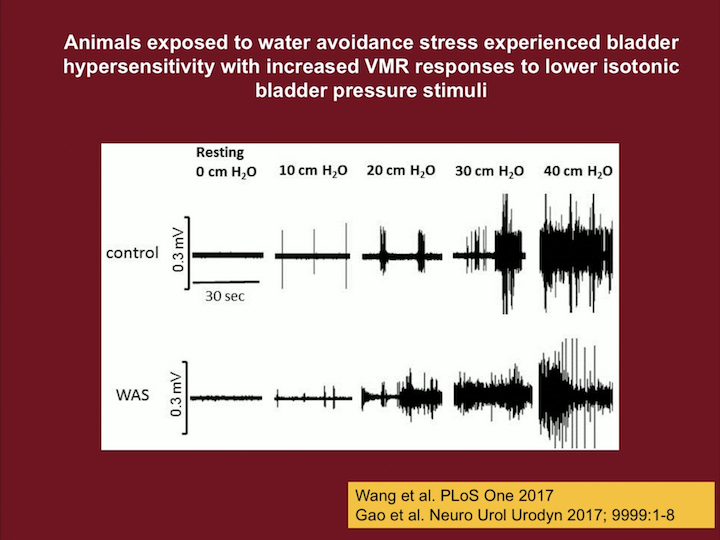 What the animals models can help us, is to know that without putting any insult in the bladder, by just giving a stressor to animal that is predisposed to anxiety, we can replicate the exact finding that we have in humans, leaving the bladder as kind of a secondary response to the brain. I want to acknowledge a bunch of collaborators. 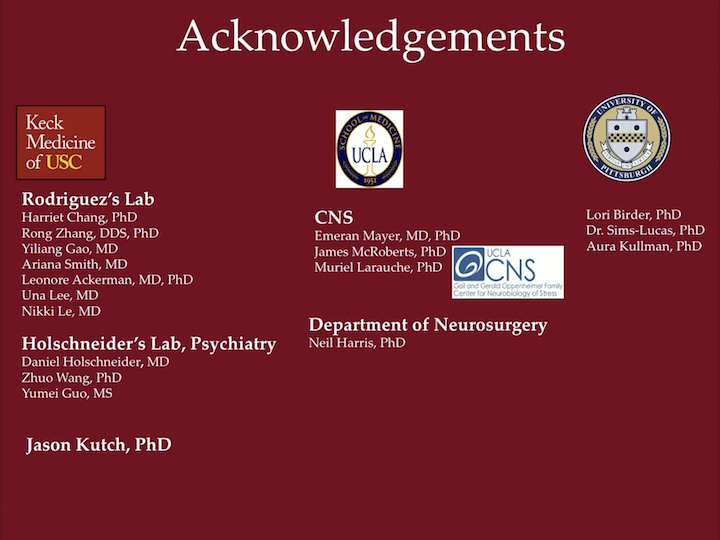 Clearly, all the members of the MAPP, but I work closely with UCLA, Holschneider’s Lab that does a lot of the brain imaging at USC, working closely with Lori Birder, with some of the bladder epithelialary directions, and I want to thank you. Dr. Rodriguez is an established surgeon-scientist with extensive expertise in the field of female pelvic and reconstructive surgery (FPMRS) in urology. Dr. Rodriguez is nationally and internationally recognized for her work in the field of stem cell research and tissue engineering. An awarded researcher, Dr. Rodriguez has developed patented techniques and innovative surgical strategies to provide treatment in areas such as stress incontinence and reconstruction of the bladder and lower urinary tract. Another focus of her research has been the study of the etiology and treatment of urinary incontinence and vaginal prolapse, in which she is active in clinical research and outcomes.